The Talbot Malton01653 639096work HotelThe Talbot stands proud in the market town of Malton. Crowned “Yorkshire’s Food Capital” by the late renowned chef, Antonio Carluccio, and Prue Leith’s “Favourite Foodie Town”. In addition to 26 individually designed bedrooms, The Talbot boasts landscaped gardens, a popular restaurant and bar, and the Malton Cookery School. Come and try our tasty Talbot menu, served daily at the bar, restaurant, or on the outside terrace. A fab and fresh look at Yorkshire produce with a focus on classic dishes such as dressed Whitby crab, Yorkshire pork belly, and Barnsley chop. Kick back with a G&T, glass of wine or local ale, and whether you're popping in for a quick bite or staying longer, you’re sure of a warm Yorkshire welcome and lots of friendly chatter. On any day, you can pick up a free Food Map from Reception and explore all that Malton has to offer, with over 35 artisan producers all within walking distance. Our coffee and ice cream is produced immediately opposite the hotel in Talbot Yard Food Court. Key dates on The Talbot’s calendar include the guided Food Tours and Gin Tours, where you can munch or sip your way around Malton’s streets: Share the passion of the artisan producers, tasting and exploring all the delicious products along the way. Get behind the scenes to learn & discover how fab food and drink is made - including; coffee, gin, artisan baking, patisserie, chocolates, cheeses, desserts and much more! Malton Cookery School is Yorkshire's finest yet most relaxed place to learn to cook. Here in the food town of Malton there is a stylish and homely kitchen where we hope you'll unleash your inner gourmet. In fact we want you to fall in love with cooking the best of Yorkshire Produce. With God's own county and coastline all around us, courses specialise in Game, Seafood and Baking as well as a variety of other courses. Whether it's learning the basics, enhancing existing skills with new techniques or perfecting classic dishes, whatever your age or ability there will be a course that's just right for you. Set in of an old congregational chapel the school is a temple to Yorkshire gastronomy! The Talbot Malton sometimes limits bookings to 2 or more days. Individually designed and is upholstered to its own theme with unique wall paper and colour schemes. Feature rooms are appointed with 6ft beds, garden views, feature artwork, luxury marble bathrooms with shower and bath. Feature Rooms sometimes limits bookings to 2 or more days. The Nantclwyd room is a rather special feature suite with four windows overlooking both the hotel garden and lawn areas producing a very light and airy room. The suite boasts an open-plan lounge area with original fireplace and large mirror, a 6ft four-poster bed plus a luxurious marble bathroom with freestanding bath and separate monsoon shower. Definitely a room worth staying in! Nantclwyd Room sometimes limits bookings to 2 or more days. The Talbot stands proud in the market town of Malton. Crowned “Yorkshire’s Food Capital” by the late renowned chef, Antonio Carluccio, and Prue Leith’s “Favourite Foodie Town”. In addition to 26 individually designed bedrooms, The Talbot boasts landscaped gardens, a popular restaurant and bar, and the Malton Cookery School. 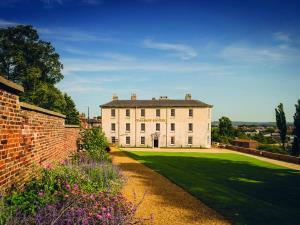 If you’re hosting an event or getting married, York House is a 300-year-old building set in the gardens of The Talbot. This stunning wedding and events venue boasts views over the lawn, as well as the magnificent River Derwent which flows through the grounds. York House, in conjunction with it’s own marquee and The Talbot’s mouth-watering catering, is the perfect venue for parties of up to 150 guests. Gun Room and Drying Room onsite Limited DVD players available Children welcome from any age. Bathroom was so small only one person could be in there at a time. The room was adjacent to a main road which was noisy throughout the night with lorries going by.I have to sleep with the window open which made this worse as the secondary glazing needed opening too. But even with this it was too noisy. No Tea or coffee making facilities in the room. Room service required. For the price paid this was ridiculously poor value for money. I don't mind paying 5 star prices but I certainly didn't get 5 star value! By Road: From the South Leave the A1M at junction 45. Take the A64 East past York until the Malton exit. As you enter Malton you will see the Talbot Hotel on the right-hand side. From the North Leave the A1M at junction 47. Take the A59 towards York. Take the A1237 that bypasses York to the North until joining the A64. Take the Malton exit. As you enter Malton you will see the Talbot Hotel on the right-hand side.